With the year drawing to a close, it’s time to reflect on the year and all of the important events that have occurred. Because there’s so much to cover, I’ll be splitting this up over multiple posts, starting with public transport. It’s been another big year for PT with a lot of progress being made on a number of fronts. Here are some of the big changes this year. Auckland’s most important transport project has made some good progress this year and it’s hard to miss the construction underway at the northern end of the city centre. 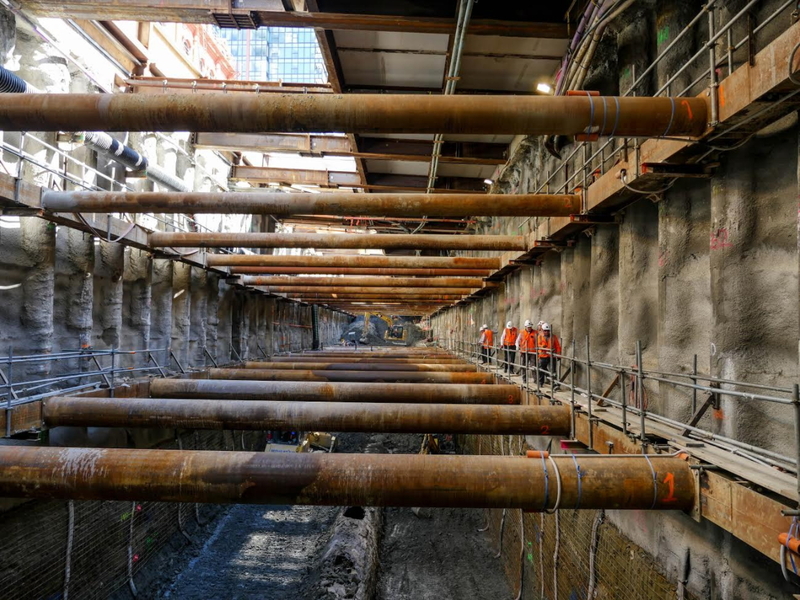 From the bright red Bentonite tanks outside Britomart to the now 18m deep trench up Albert St, the area is a hive of activity. 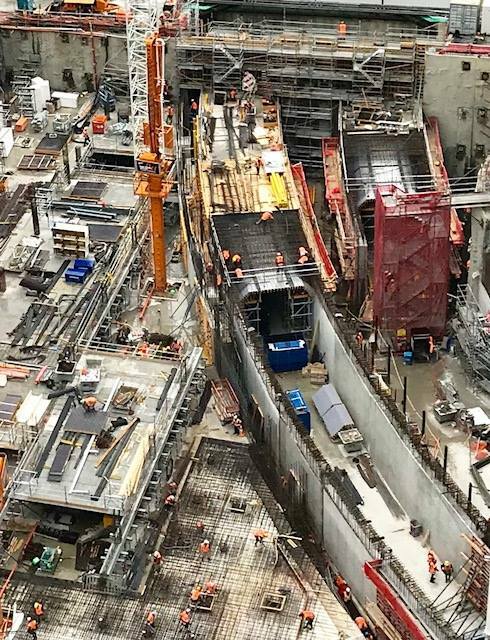 On Albert St the tunnel slab has now started to be poured and whilst at the Commercial Bay site the tunnels are now clearly visible. The ‘early works’ have provided the visible sign of progress and behind the scenes work is still progressing on the rest of the project. This includes tendering for the ‘main works’ on the project which will build the rest of the tunnels and the stations. We were hoping the two companies to be shortlisted for this would have been announced by now, but regardless, it won’t be till sometime in 2018 that we know who’ll be tasked with building it. Things haven’t been perfect though and we’ve been critical of some of the decisions made, particularly in relation to the Karangahape Rd station and the potential to future-proof for longer trains. At K Rd, we believe that it’s important entrances are built at both Beresford Square and Mercury Lane for day one, not just the latter like currently planned. One reason for this is that an entrance at Beresford provides better accessibility for those with disabilities. Comments by the head of the CRL project that the steep walk up to K Rd as being “not a difficult walk” that’s “good for you”, and later that it’s fine because other streets in the city are steep, have shown a huge lack of understanding of the need to build an inclusive city for all. This is something we hope will be rectified in 2018. The good news is that the numbers for both South and West Auckland are showing improvement on what they were prior to each being implemented. The area we’ve been most disappointed with as part of the new network is the abysmal frequencies on the rail network off peak and on weekends. Rail is meant to be the strategic core of the network, yet at times it’s running less frequently than the services that connect to it. Light Rail has been one of the most talked about issues this year. The former National government were not huge supporters of the project, and like they were with the CRL, kept trying to throw roadblocks up ahead of it. One of those was the Advanced Bus Study, to see if buses could do the job, ultimately finding they couldn’t. Following that, the NZTA board agreed that Light Rail would be needed eventually and the government agreed too. But eventually was discussed as being 30 years away when it’s needed now. That all changed with the election of a new government, who have been highly supportive of expanding our PT system, including specifying light rail to the airport and to the Northwest. In October a Board of Inquiry granted consent for the Northern Corridor Improvements. 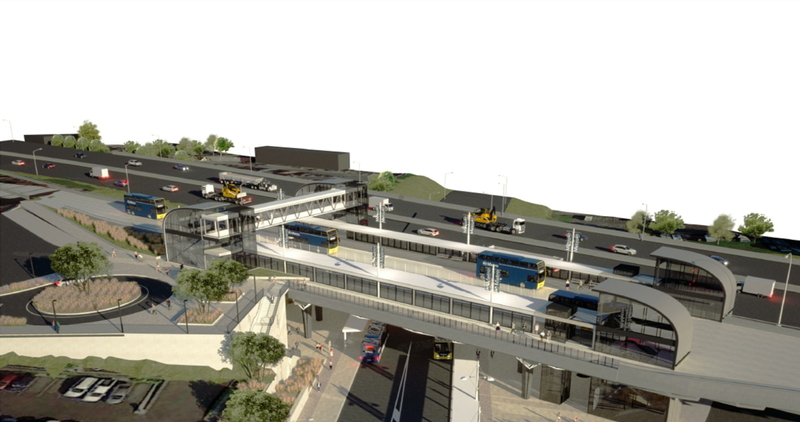 Part of that project will see the hugely successful Northern Busway extended from Constellation station to Albany. As part of that work, just this month, it was announced that a new station at Rosedale Rd will be built. It’s an impressive looking station. In April we launched the second iteration of our Congestion Free Network. 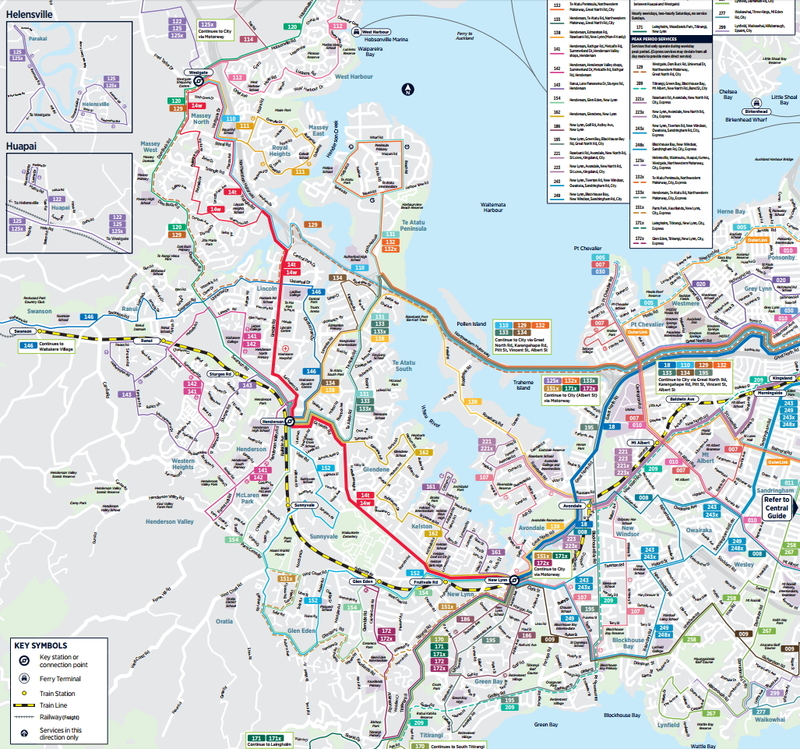 We updated and redesigned the CFN to take into account the latest thinking and understanding on transport in Auckland. A key part of the CFN is of course to push forward the discussion of transport. On that front we’ve been astounded by the response to the network and are proud the new government has adopted it as part of their official transport policy. 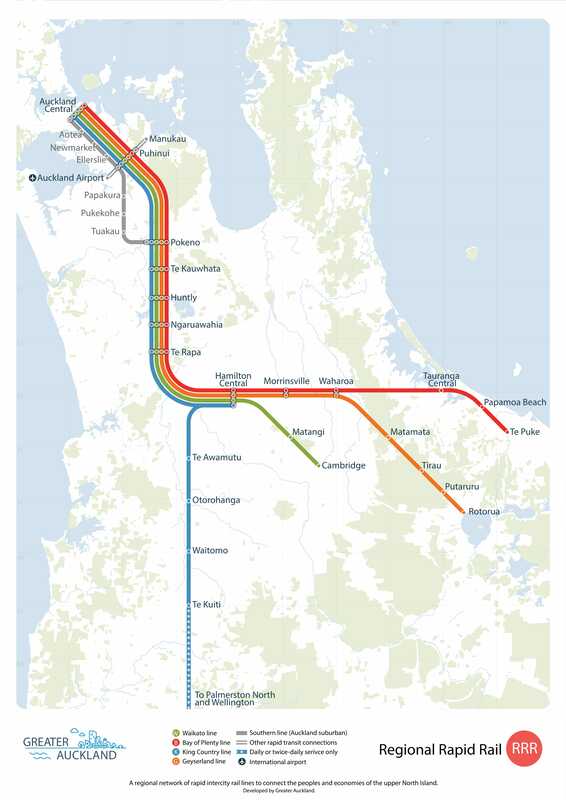 In August we launched Regional Rapid Rail, to push the discussion of regional connections. Again we’ve been astounded by the response. Particularly that it was quickly adopted by both Labour and the Greens. The change in government has resulted in a significant shift in the discussion of transport. Projects like Light Rail are not only supported by the government but enshrined in the agreements between the political parties involved. The new Minister of Transport, Phil Twyford, has already shown a great understanding of transport issues, and importantly, how it integrates with land use. That’s important given his other portfolio is Housing. Combined with Julie Anne Genter and Shane Jones as Associate Ministers of Transport and it’s going to be an interesting three years. It’s been a big year for ridership with a number of milestones reached. For the 12 months to the end of November overall ridership was up 7.6%. There are now more than 90 million trips on the network, passing that milestone in September. That’s up more than 20 million trips in just 4 years. Milestones were also reached on our Rapid Transit network. In August we surpassed 20 million trips on the rail network, a milestone the Ministry of Transport didn’t expect us to reach before 2020. In the same month we also passed 5 million trips on the Northern Busway. I think that’s enough for this post. Is there anything major I missed? 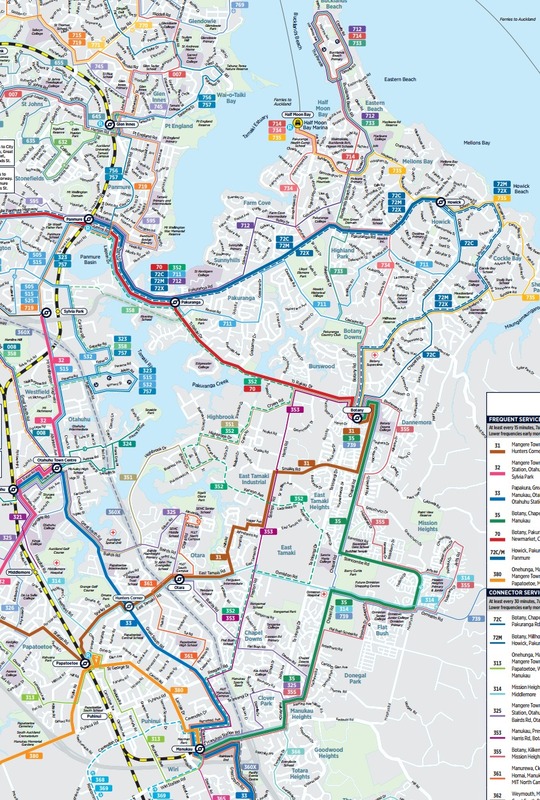 Another year without significant progress on the Eastern Busway. Supposedly the most important project after the CRL and we’ve not heard a word about it from the new government. Nothing major you’ve missed, just the rollout of the New Network for the east. Happy holidays! Those kinds of comments by the head of the crl project, no less, are a key reason New Zealand lags behind the rest of the developed world. The ‘she’ll be right’ ‘good enough is near enough’ approach. Yes we have capital constraints but do it right the first time. (I give you the leaky building fiasco). Well we’re told that we shouldn’t let Best be the enemy of Better. But in this case it does seem that once again with CRL and K’Rd station we’re letting the “Bare minimum” be the enemy of both Better and Best. Hopefully, now Julie Ann is on the case and as The Government is a 51% shareholder or CRL Ltd, that they will fix that deliberate oversight and poor design issue. And ensure it will be fixed if it has not in fact already has. So its possible that a redesign of the K’Rd station and consequential changes to the bored tunnel geometry leading to and away from the station, to ensure it caters for car 9 EMUs has held back the main tunnels tendering being completed and announced? If so, then I’d like to say now, for the record, that I for one, Welcome our new Labour-led Government Transport Overlords. As they are clearly so much more in command of the Auckland PT situation after only a few dozens of days of power, than the last lot ever were – after 9 years. The costs of adding the 2nd entrance to K Rd and making the stations capable of 9-car EMU is minimal in the scheme of things but trying to add them later will be expensive to the former and almost impossible to the latter. The currently planned and constructed infrastructure is all exciting stuff, but what about utilising what we have? 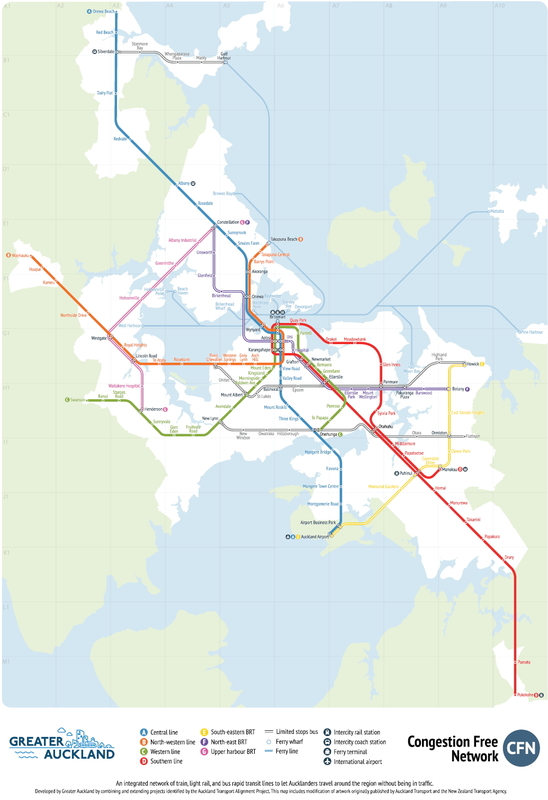 It seems that the two worst congested places in Auckland today are Sylvia Park, with a train service that delivers hundreds of people per train; and Link Drive, a few hundred metres away from the Northern bus way. Is AT really committed to the better use of public transport? 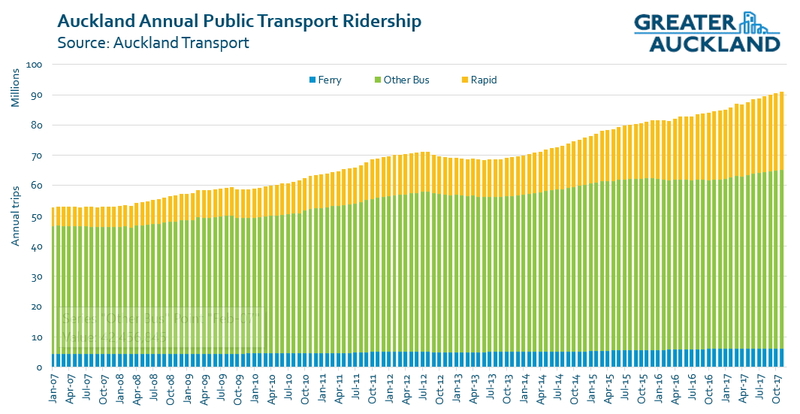 So Auckland achieved 7.6% growth in public transport trips for the year. I am betting that this number was swamped by the increase in motor vehicle trips. Not too mention the population growth in Auckland due to the previous governments reckless immigration policies. Stu, while it is true that there has been a drop in NZers heading overseas and a slight increase in NZers coming home, it still doesn’t account for our country gaining hundreds of thousands of new immigrants under the previous National government which is one of the primary reasons why we have a huge infrastructure deficit (particularly in Auckland) a record level of housing shortages, record levels of poverty, record rent prices and housing prices to go along with other issues like schools/hospitals etc. With the coming technological and automation revolution there isn’t a need for a much larger population (especially when the country can’t cope with the above). We have the fastest rate of immigration in the developed world which is not only reckless and irresponsible but pure greed and insanity by the National Party and their masters. We need more not less immigration! At the moment the following industries are struggling for staff – Hospitality, Construction (Engineering, Building, and skilled labour), Tourism, Services (Power, 3 Waters, etc), Argiculture, Technology. With these industries struggling for staff over the last 3 years, how are we going to cope when immigration stalls, if it in fact it does. My suspicion is that some of the numbers will be fudged (the way we calculate will change) to keep Winston happy, and only ‘skilled’ people will be allowed to enter. E.g. exactly the same situation as last 9 or so years. The fact is we need immigration to keep up, and it benefits our country in so many ways. Without it we certainly wont be able to build an extra 1000 homes a year, finish the required transport projects etc. No Josh we don’t need more we just need the correct types. Stop bringing in people in categories we don’t need and you then have space to bring in the one’s we do need! Hospitality shouldn’t be one of those categories – pay decent pay and you’ll get more Kiwis doing it. The other way for hospo is to allow more temporary holiday/work visas for countries that reciprocate with NZ that Kiwis want to go to (eg UK/EU/Canada etc) you then get people who are here to visit NZ for a year or 2 and do some work in an industry that is often best with lots of international people since tourism is so big here. What it doesn’t need is dodgy students that are just doing it so they can get permanent residency. Shouldn’t immigration be decided based on ethics? Heidi, it should be based on what is best for the country with a touch of compassion for genuine refugees (not economic refugees). To be fair, that congestion was largely for appliance sales at places like JB and Harvey Norman… you’re not going to purchase a new flat screen TV via train or bus. You aren’t. I happily would. I’ve seen many items that big on buses over the years. I would disagree that Boxing Day sales are largely about large appliances. Some sure, but the majority of people out there are buying clothes, shoes and small items. Just stand at the door and see how many people leave the mall with a bag or two in their hands. Funny the amount of people that claim “I could never carry my purchases on the bus” but them proceed to carry them the length of the mall and across the carpark. At a place like Sylvia Park you can easily walk a kilometre between a particular store and some parts of the parking. I feel the best and cheapest way to increase patronage is to replace long winding pathways to a platform with escalators and short underpasses. Build more easy access paths from nearby streets. Open platform 1 at Otahuhu which wouldn’t require any climbing and is a few meters easy walk from the bus stop. Why are we using platforms 2 and 3 rather than 1 and 2. I think the very busy Sylvia Park could have easier access with 2 escalators or an underpass. I’d like to remind all that I keep on insisting Sylvia Park should be a multimode integrated hub like Britomart is now, covering both upstairs and downstairs by Hoyts and also in and around the SE highway, new office tower. I’ve posted up rough MSpaint Doodles in previous posts here related to Sylvia Park and greater Highbrook area. I think it could do with at least a look over. I welcome scrutiny and would even be amazed if someone can take my concepts even further and make them better. All in all a pretty good year. +1 to more frequent trains. The planned increase for next year is just too incremental and lame. What’s up with the 14w and 14t buses from Henderson stopping at bus stops that are streets away from Westgate shopping centre?!?!? What fool relocated them? There was a central stop right in the shopping centre, now the buses stop streets away and it’s quite a walk. Haven’t been back to Westgate since. As someone using Sylvia Park train station for the first time and Auckland’s buses for the first time since ‘06 due to living in Europe, I too found the intergration of Sylvia’s station into the mall appalling. It should be a sloped underpass from the south platform straight in, not a small over bridge as is and there should be no need at all to use a bridge to head north, only a ramp. As for the buses, differentiating by a number then letter is very confusing (eg 53a, 53b) and having the bus station diagram use the same colour for both routes only makes it worse. I’ve never seen this in North America or Europe. They really should be separately numbered routes to avoid confusion (53 and 54 or 53 and 153 etc).